Urine casts are cylindrical, cigar-shaped structures produced by the kidney and present in the urine in certain disease conditions. All casts are composed of a mucoprotein known as Tamm-Horsfall protein which is secreted by the distal loop of Henle, the distal tubule and the collecting ducts at a fairly constant rate. A significant number of urinary casts usually indicates the presence of renal disease. Urinary casts are formed only in the distal convoluted tubule (DCT) or the collecting duct. The proximal convoluted tubule (PCT) and loop of Henle are not locations for cast formation. Casts are the result of solidification of material (protein) in the lumen of the kidney tubules. 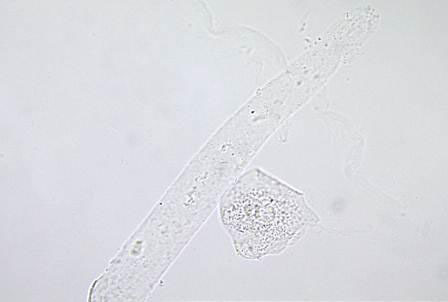 Once formed, these casts of the tubule are eliminated via the urine and may be seen in the urine sediment. They may contain RBCs, WBCs, renal epithelial cells, fat globules, bacteria, and degenerated forms of any of these structures, which are seen as granules. Aggregates of plasma proteins, including fibrinogen, immune complexes, and globulins, may also be seen as granules within a cast. Urinary casts can be divided into two main categories : Acellular and Cellular Casts. Hyaline casts are the most common type of casts which are composed of solidified Tamm-Horsfall mucoprotein. They have smooth texture and a refractive index very close to that of the surrounding fluid. Generally, hyaline casts have parallel sides with clear margins and blunted ends. Hyaline casts can be seen even in healthy patients. They may be seen in increased numbers during dehydration, exercise or diuretic medicines. Granular casts result either from the degeneration of cellular casts, or direct aggregation of plasma proteins or immunoglobulin light chains. They have a textured appearance which ranges from fine to coarse in character. Their appearance is generally more cigar-shaped and of a higher refractive index than hyaline casts. 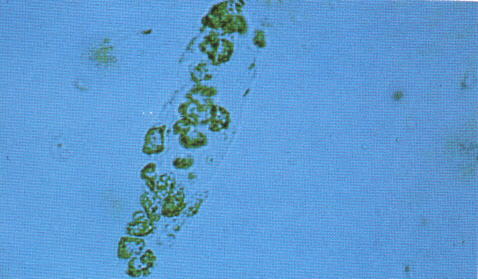 They are seen after sternous exercise, chronic renal diseases, acute tubular necrosis etc. 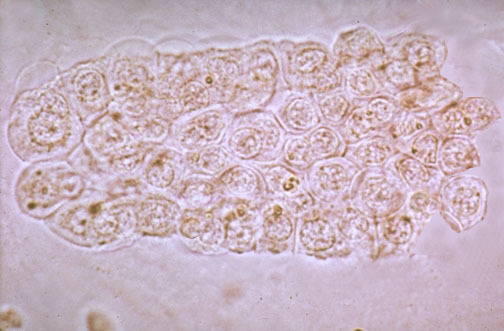 Waxy casts represent the final stage of degeneration of cellular casts. They are more refractile and therefore easier to see compared to hyaline casts. They are uaually seen in tubular injury of a more chronic nature than granular or cellular casts like severe chronic renal disease and renal amyloidosis. These casts are also called renal failure casts. 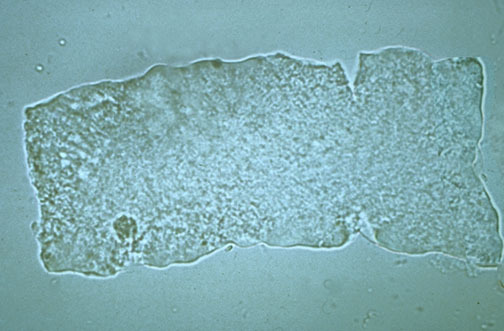 Fatty casts are formed by the breakdown of lipid-rich epithelial cells. These contain lipid droplets within the protein matrix of the cast and are identified by the presence of refractile lipid droplets. They are usually seen in the conditions like tubular degeneration, nephrotic syndrome, hypothyroidism etc. 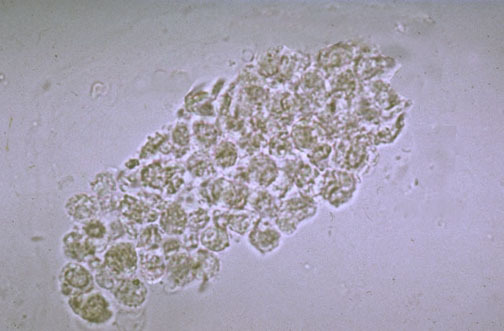 A cellular cast may be composed of any of the cells found in the urine sediment, such as RBC, WBC, or renal tubular epithelial cell. The cellular cast appears to result from a clumping of cells that are incorporated in a protein matrix. Red blood cells may stick together and form red blood cell casts. Such casts are indicative of glomerulonephritis, with leakage of RBC’s from glomeruli, or severe tubular damage. White blood cells (generally neutrophils) are present within or upon casts. These casts are typical for acute pyelonephritis, but they may also be present with glomerulonephritis. 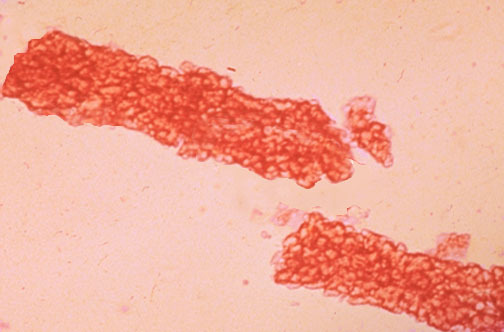 They may also be seen in acute interstitial nephritis, lupus nephritis, and acute papillary necrosis. These casts are composed of renal epithelial cells. These casts are seen in conditions such as renal tubular necrosis, viral disease (such as CMV nephritis), and kidney transplant rejection. 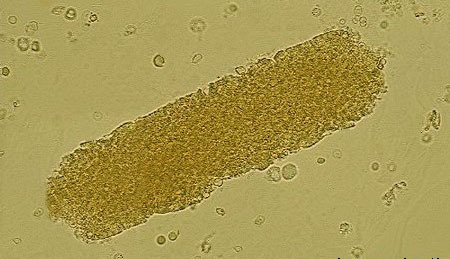 Bacterial casts are casts composed of bacteria in a protein(hyaline) matrix. Bacterial casts are diagnostic of acute pyelonephritis or intrinsic renal infection. These r rare conditions n not seen usually. Thanks for these pictures. Will be helpful in training. Am 24 years of age and when ever are urinate , the urine passout in parallel for almost 1 year today ,thank you .